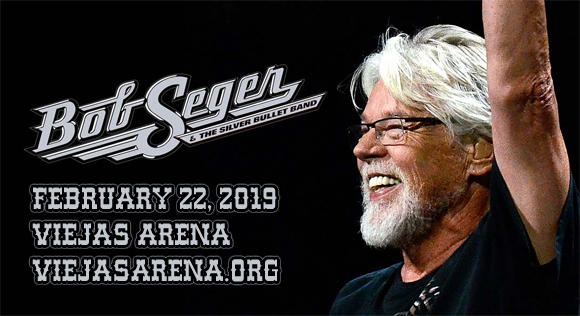 It's time for the Travelin' Man to hang up his hat, but before he does, Bob Seger And The Silver Bullet Band are headed to Viejas Arena on Thursday 21st February 2019! A music industry icon and one of the world's best-selling artists with a career that spans over six decades, Seger has a wealth of beloved songs to choose from to make the set-list for this very special tour! Make sure you don't miss your final chance to see this legend live! Blue collar roots rocker Bob Seger is an American singer-songwriter, guitarist and pianist whose career spans over six decades. Finding local success in the Detroit area throughout the 1960s under the names Bob Seger and the Last Heard and Bob Seger System, his breakthrough came in 1968 with the track "Ramblin' Gamblin' Man". After some solo success in the early 1970s, Seger formed the Silver Bullet Band in 1973 and three years later released the album Night Moves, which was a national hit and eventually went six-times platinum. Some of Seger's biggest hits to date include "Turn the Page", "Still the Same", "We've Got Tonight", "Against the Wind", "You'll Accomp'ny Me", "Shame on the Moon", "Like a Rock", and "Shakedown", which was written for Beverly Hills Cop II (1987). He also co-wrote the Eagles' number-one hit "Heartache Tonight", and his recording of George Jackson and Thomas E. Jones III's "Old Time Rock and Roll" was named one of the Songs of the Century in 2001. Throughout his career, Seger has sold more than 75 million records worldwide, making him one of the world's best-selling artists of all time. He was inducted into the Rock and Roll Hall of Fame in 2004 and the Songwriters Hall of Fame in 2012.